including all pronouns of God. Now you can search for individuals, not just for names! Now All Named Individuals In The NT are Marked by Pronoun. Phrase Searching With ID Now Possible. Two New Interactive Charts Linked To ExLBP Database. Ussher's Annals of the World Added to the Bundle. 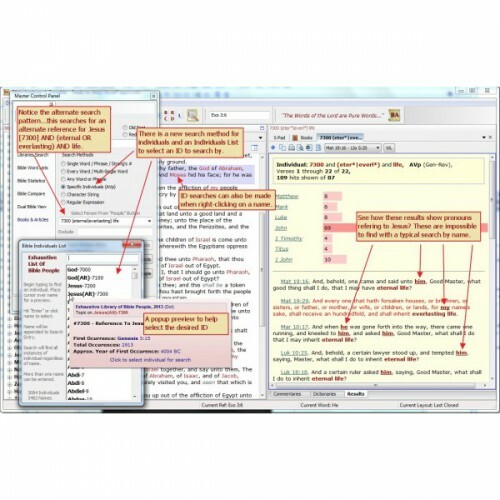 We have updated the already powerful and unique AVp bundle to now include the linking of all named individuals in the New Testament by pronoun as well as name. Now the pronouns of individuals can be search just like the pronouns of deity. Also, phrase searching with an ID is possible. For instance, "7300 heart" can be entered to find all places where Jesus by pronoun can be searched followed by "heart." This opens up even more unique search opportunities. Another new feature are two interactive charts linked to the ExLBP in both directions! That is, every name in the charts are linked to the ExLBP database and each person in the database found in the Bloodline chart is linked to it. The chart will open and automatically scroll to the name and highlight it! Also, dates in the charts are linked to Ussher's Annals of the Words module which is now included in the bundle. 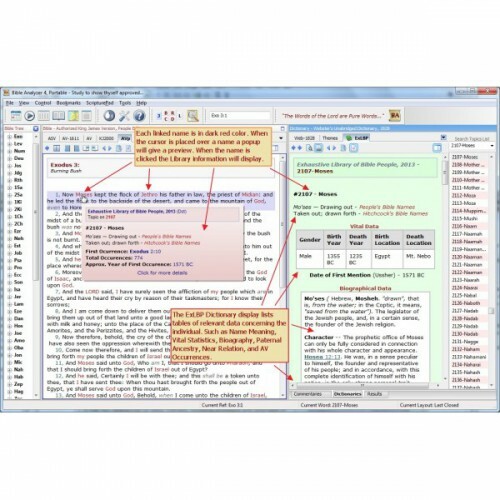 The modified edition of the Authorized Version Bible we developed called the Authorized King James Version, People Edition (AVp) plus the Exhaustive Library of Bible People dictionary (ExLBP) has been a dream of the editor for many years. With the marking up of each individual in the Bible text with a person ID, including all references to deity (over 50,000 instances), methods of searching and determining people associations that were previously not possible with Bible Software became possible. For instance, it has long been known there are six different Mary's in the Scriptures, but even with sophisticated searching algorithms, distinguishing between them by a name search with any software program was not possible. However, with a text such as the AVp which has each instance of "Mary" marked with an ID unique to each individual, searching for one (or more) specific "Mary" is simple. The markup in this text does not stop with names, though. Concerning God it has ALL references to deity marked, including pronouns and alternate or indirect names or designations! Not only is God, Lord, Jesus, etc. marked. Pronouns such as thee, thine, my, mine and I are marked plus alternate names or designations such as Word, Lamb, Prince, Son, and seed. Furthermore, these designations have separate IDs for each person of the Trinity and even the appearances of God in human form (Theophany) are marked separately! 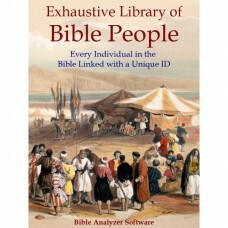 There are nearly 3100 more IDs for the other persons in the Bible. 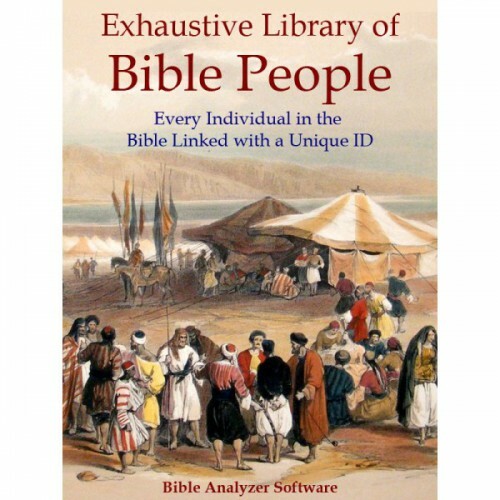 The Exhaustive Library of Bible People is the companion resource of the AVp and is intended to work in conjunction with it. This Library contains data such as, Name Meaning, Vital Statistics, Bioagraphy, Paternal Ancestry, Near Relation, and AV Occurances of each of the 3084 distinct individuals found in the Scriptures. It also provides the edited data for the popups that display when the cursor is placed over a name in the AVp. It would be hard to overstate the value of a resource such as this for searching and finding associations concerning individuals in the Bible. To the right we have a couple images that can only give a hint of the power of such searches.